For as long as people have lived, we’ve sought ways to make more out of what we have through trade. In 3000 B.C. the Sumerians created the ‘sila’, the first ‘token’, which began with a small bowl used to measure a standardized volume of barley. This original ‘currency’ established the foundation of finance. 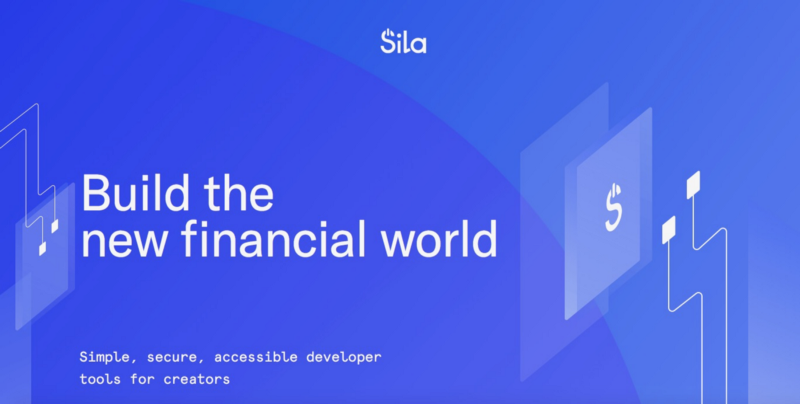 Today I’m excited to announce Sila: a simple, secure, and accessible suite of developer tools and an API platform to help build the new financial world. We started Sila with a clear mission — to empower developers by providing open-source infrastructure for the fintech companies of tomorrow. Now, with our pre-seed investment secured from a strong network of experienced angels across fintech and emerging technology — including Jerry Neumann, Taavet Hinrikus, Iyin Aboyeji, Village Global, Mucker Capital, and 99 Tartans — we’re preparing to launch the alpha of our API in the coming months. While I’ve been a part of many truly exceptional organizations over the years, nothing compares to the deep expertise, industry knowledge, and passion of this founding team that brings together more than 60 years of combined experience at the forefront of their industries, ranging from legal, to finance to nuclear power. Our Chief Technical Officer, Alexander Lipton, is an MIT Fellow and a Visiting Professor of Financial Engineering at EPFL, who previously ran Bank of America’s global quant business. Sila’s Chief Legal Officer, Angela Angelovska-Wilson, comes to us after a distinguished career at Reed Smith and Latham & Watkins, then as the Chief Legal and Compliance Officer of Digital Asset Holdings and is the co-founder of DLx Law, the leading blockchain law firm. Isaac Hines, Sila’s Chief Operating Officer, boasts an impressive management career in the energy sector, where he led projects totaling upwards of $200m and most recently worked at NuScale, a nuclear power startup. Together, we recognize that the financial world needs better support, now more than ever. Despite extensive efforts to innovate, the current financial system is controlled by a long chain of middlemen engaged in moving money between a buyer and a seller. Bureaucracy, legacy software, and complex regulatory environments have held back innovation and disruption in banking, and fixing this has motivated much of my career over the past 10 years. You might say the driving force that drew our founding team together was a shared motivation to solve these challenges. Alex has written extensively about his experience fighting for good on Wall Street, while Angela built her legal practice around helping banks, investors, and VCs navigate complex environments, most recently when she helped setup and run Digital Asset Holdings. I have been skeptical of crypto as a solution — until late last year when I began to wonder if we could solve the scalability and stability problems that bedevil crypto apps. I recognized that this would require bringing the best of crypto and fintech together in order to build a bridge from the familiar to the future. And that’s just what we’ve done in creating Sila: an API platform and suite of developer tools supported by a new regulatory-compliant, fiat-backed tokenized means of exchange — the Sila Token — that allows developers to rapidly build fintech applications and bring them to market. The Sila token is pegged to the US dollar via a centralized, 100% reserve held in USD-based instruments, and is guaranteed to be stable and retain its value even in the most extreme volatility environments. Perhaps most importantly, it forms the basis for a fintech API platform that will enable fast, regulatory-compliant payments, and other uses of money, with minimal reliance on the traditional banking system. One of the biggest impediments to unleashing creativity and developing new business models in finance is the absence of open access platforms for money and identity. I know this from the frustrated accounts of many fintech founders and my own grueling first-hand experience to disrupt banking, first at Simple, and then from the inside out at BBVA. Existing payment systems like ACH, Visa, and SWIFT are inaccessible to all but a handful of large incumbents. This creates an ecosystem where even when innovators do succeed in gaining access to the underlying infrastructure, they struggle to integrate effectively. While blockchain-based payment systems can significantly reduce many of these barriers in theory, none of the existing ecosystems have banks worthy of the name. They’re forced to rely on algorithmic monetary policies for cryptocurrency creation, leading to highly volatile cryptocurrencies. In essence, these systems resurrect in one way or the other old ideas of central planning, without fully appreciating the consequences. Meanwhile, incumbents in the world of finance, who are naturally risk averse, have avoided working with blockchain-based payment systems for precisely this reason. This hampers the development of critical infrastructure such as payment gateways and custodians, without which developers using blockchain platforms have struggled to build applications targeted at the mass market. Blockchain technology has already demonstrated immense promise, but the industry needs the right tools to unleash its full potential. At Sila we’re building these tools, and our mission is to enable a wave of innovation for crypto and fintech developers, and in turn, make money work better for everyone. Today, we’re encouraged by early feedback from an active cohort of creators using our API and we look forward to expanding access with a private alpha later this year. Learn more: Fintech and blockchain developers interested in building the next wave of financial innovation can sign up for our alpha waitlist. For more information visit www.silamoney.com.